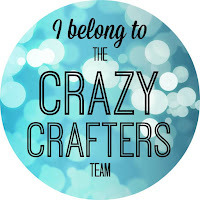 Stampin' Up are very generous with the freebies for those who attend events! One of the three stamp sets that I came home with from On Stage Local in the Gold Coast is called Bird Banter. It has several cute little birds together with some funny and punny little greetings! 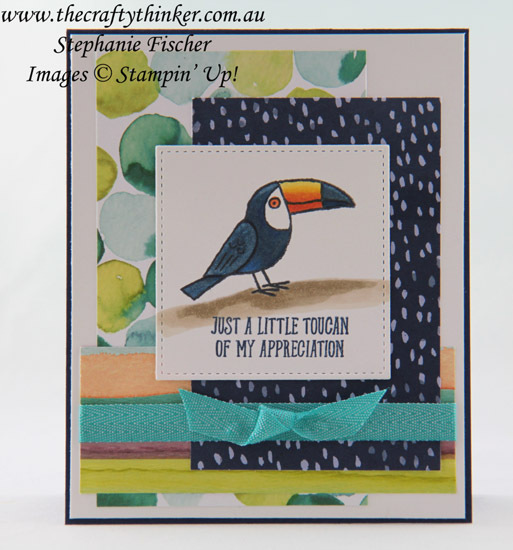 I coloured this toucan with Stampin' Blends alcohol markers (my new go to colouring tool!) and then cut him out with one of the Stitched Shapes dies. There isn't a black marker and the Dark Basic Gray wasn't dark enough, so I added a layer with the Dark Night of Navy marker. The base card is Night of Navy to which I added a layer of Whisper White decorated with small pieces of the Naturally Eclectic Designer Series Paper and some Bermuda Bay Mini Chevron Ribbon. The greeting is stamped with Night of Navy ink.